A R E A is currently hosting the work of Anthony Young, featured in the Globe as one of the most relevant emerging artists of 2016 in Boston, and SHEP, winner of the 2016 Springborn Fellowship, the most prestigious undergraduate award at the School of the Museum of Fine Arts. He is a MFA graduate of Tufts University. 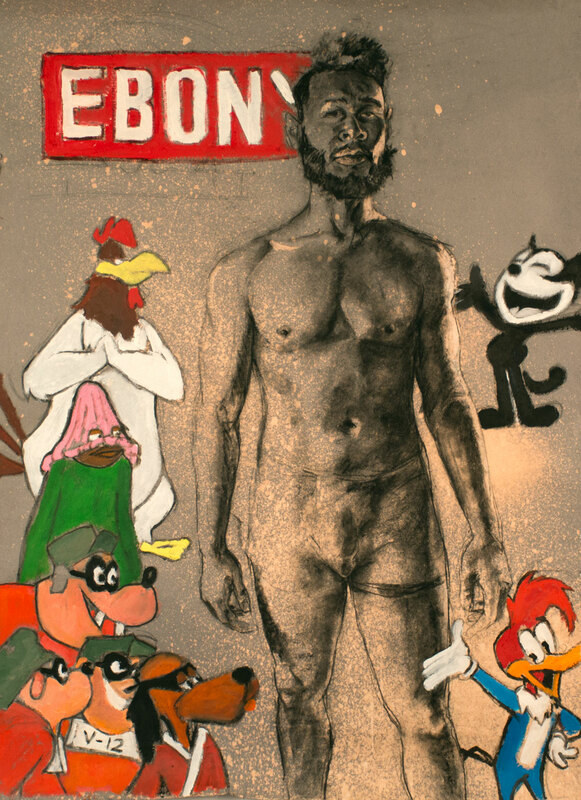 His work explores race, gender, and identity through drawing, painting, paper, and printmaking. 2017 Resuscitation. Industry Lab, Cambridge, MA. Coded, Lesley University, VanDernoot Gallery, Cambridge, MA. 2016 Stark Naked, Gallery Kayafas, Boston, MA. Medal Award Gala, honoring Mona Hatoum, Museum of Fine Arts, Boston, MA. Graduating Students & Award Recipients Exhibition, SMFA, Boston MA. The Cyclorama Show: MFA Thesis Exhibition, Boston Center for the Arts, Boston, MA. She Comes in Rags Painting Biennial, School of the Museum of Fine Arts, Katherine Lane Weems Center, Boston, MA. Drawing Connections, Museum of Fine Arts, Courtyard Gallery, Boston MA. Re Entry, School of the Museum of Fine Arts, The Katherine Lane Weems Center, Boston, MA. Paper & Print Juried Exhibition, School of the Museum of Fine Arts, The BAG Gallery, Boston, MA. Juneteenth, Museum of Fine Arts, Boston, MA. Self Reflections, Clay Center for the Arts, Charleston, WV. First Year Exhibition, Piano Craft Gallery, Boston, MA. 2014 Senior Exhibition, Della Brown Taylor Art Gallery West Virginia State University, Institute, WV. Sorrow & Rapture Art Exhibit, WVSU Art Department Gallery, Charleston, WV, Juror Arif Khan, Curator Clay Center for the Arts. Drawn Together, Taylor Books, Charleston, WV. 2013 Holiday Show, Taylor Books, Charleston, WV. Beyond the Margin, Good New Garage, Charleston, WV. Pride Arts 2013: Art of the Real, Unitarian Universalist Congregation Church, Charleston, WV. 2012 Juried Student Art Exhibition, WVSU Art Department Gallery, West Virginia State University, Charleston, WV. Second Cousins, Gallery 842, Huntington, WV. Juried Student Art Exhibition, Della Brown Taylor Art Gallery, West Virginia State University, Institute, WV, Juror, Peter Massing, Professor of Art, Marshall University. 2009 Juried Student Art Exhibition, Della Brown Taylor Art Gallery, West Virginia State University, Institute, WV, Juror, Barbara Racker, Curator, Clay Center for the Arts. 2008 Drive Thru Art Show, Juried Exhibit, West Virginia State University FestivAll, Charleston, WV. Allied Artist Juried 66th Exhibition, Huntington Museum of Art, Huntington, WV, Juror, Andrew Jonson, Associate Professor of Art, Carnegie Mellon. 2016 President’s Research Award, School of the Museum of Fine Arts Boston, Boston, MA. 2014- 2016 School of the Museum of Fine Arts Boston Merit Scholarship, Boston, MA. Redesign, Recycled Design Internship, Habitat for Humanity of Kanawha & Putnam Restore, West Virginia State University Charleston, WV. Second Place Sorrow & Rupture Art Exhibit, WVSU Art Department Gallery, Charleston, WV, Juror Arif Khan, Curator, Clay Center for the Art. 2010 First and Second Place Juried Student Art Exhibition, Della Brown Taylor Art Gallery, West Virginia State University, Institute, WV, Juror, Peter Massing, Best of Show. 2008 Honorable Mention Allied Artist Juried 66th Exhibition, Huntington Museum of Art, Huntington, WV, Juror, Andrew Jonson. 2017 Evergreen Review, Urgently Visible Why Black Lives Matter, Winter 2017. 2016 Boston Globe, Introducing this year’s class of emerging artists, April 21, 2016. 2010 Yellow Jacket, WVSU Newspaper, Vol. 68 Number 9, March 2010. 2009 Yellow Jacket, WVSU Newspaper, Vol. 67, Number 13, April 2009. 2016-17 Museum of Fine Arts, Teaching Assistant/ Teacher, Museum of Fine Arts, Boston, Massachusetts. 2015 Students Curate Students In, De, Re-Form, School of the Museum of Fine Arts, Boston, Massachusetts. 2014 Hung Liu, Self-Portraits and Selfies Workshop, Huntington Museum of Art, Huntington, West Virginia. 2013 Ray Turner, Painting/ Drawing Workshop, Huntington Museum of Art, Huntington, West Virginia. 2016 Portrait of Bessie Coleman, Pencil on Paper(11.5 X 14), Mike Mandel. 2013 M.O.N.A. Portrait Raffle, oil on canvas (20x 24), West Virginia State University, Student Organizations. 2012 Portrait of Dr. Tererai Trent, pencil on paper (11.5 x 14), West Virginia State University, Communications Department. Portrait of Dr. Hazo W. Carter, pencil on paper (11.5 x 14), West Virginia State University, Communications Departent. 2010 Portrait of Maestro Grant Cooper of West Virginia Symphony, pencil on paper (11.5 x 14), West Virginia State University, Communications Department. 12 Angry Men illustration, Kanawha Players Theater Company, Kanawha Players Theater, Charleston, WV. A Raisin in the Sun illustration, Kanawha Players Theater Company, Kanawha Players Theater, Charleston, WV. 2009 African Company illustration, pencil on paper (11.5 x 14), West Virginia State University, Communications Department. 2016 School Museum of Fine Arts, Boston, MA, Teaching Assistant Properties of Pulp, preparing pulp, media set up, classroom setup, Graduate and undergraduate students, Fall 2015- Spring 2016. Museum of Fine Arts Boston Teaching Assistant, Helping with classroom setup and cleanup, guiding students through the museum, helping the students with the instructor’s lesson, prepping materials for class. Ages 7-12. 2015 School of the Museum of Fine Arts, Teaching Assistant, Social Engagement: Practice and Theory, setting up classroom, engage in class discussions, media set, visit student sites with professor. Graduate and undergraduate students, Spring 2015. Creative Arts at Park, Brookline, MA, Counselor/ Teacher, teaching children from age 6-15, taking attendance, setting up class rooms and materials, planning assignments for classes, Summer 2015.